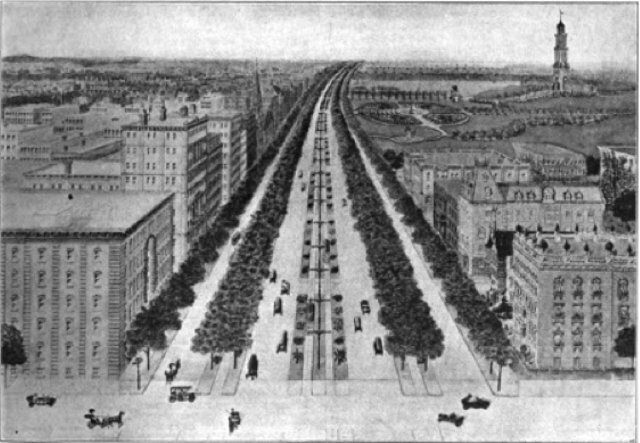 STREETSBLOG published this interesting image of a 1914 proposal for Queens Boulevard from the borough’s Chamber of Commerce. They also linked to a recent project for the Boulevard by a group called Planning Corps. 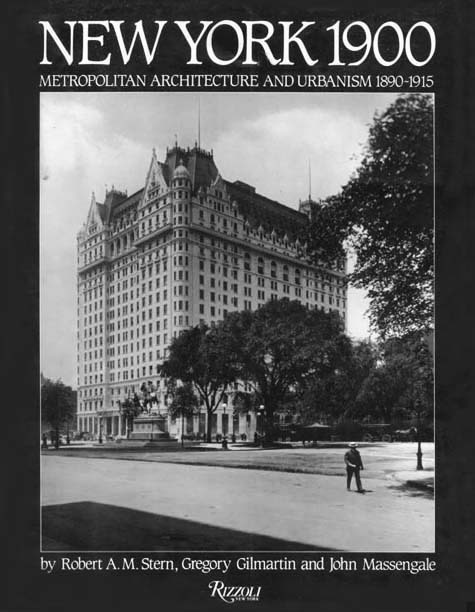 I hadn’t seen either of these projects before (although I know one of the founders of Planning Corps, and saw some of their base data), but it’s good to know that in both 1914 and 100 years later multiple groups and public processes came up with similar ideas. We know the ideas are enduring and popular. * So, can we build them now? Second, there are differences in how we might build it today. The belief that perhaps Organized Motordom isn’t always right gains more and more supporters, along with still-evolving concepts like Slow Streets and Shared Space. The conceptual images we made for Transportation Alternatives show slow lanes along each side of the boulevard that are very different than the ones shown above—or what would have been done until recently. The distance from the buildings to the center traffic lanes are similar (maybe even identical), but the Chamber of Commerce image still gives more room to the cars and less to the pedestrians, while the new images show slow-speed side lanes that cars, cyclists, and pedestrians will share. Also different in the new design are three types of bike lanes and “green” bike lane that functions as a low-tech stormwater management system. Many of the commenters at the Streetsblog article are skeptical about all the trees shown in the two Photoshop images we made, but there are a couple of things that can be said about the trees. First, new technology like Silva Cells allows us to do things that couldn’t easily be done 100 years ago. 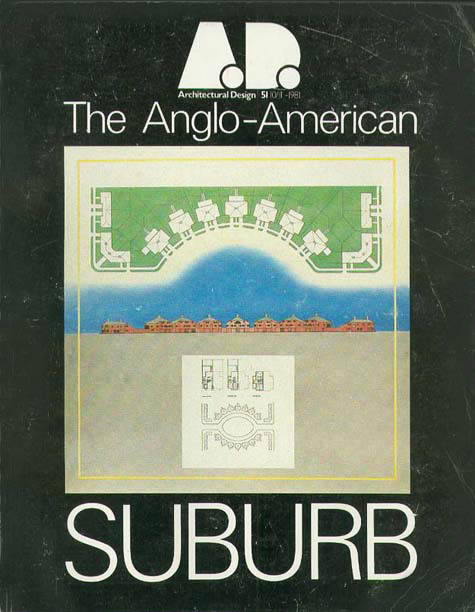 And second, that old proposal and the new ones have similar issues, because the old view is an idealized one that doesn’t acknowledge that the subway moves around underneath the boulevard—so the center of the subway is not always under the center of the boulevard. For a variety of reasons, we intentionally took our aerial view at a point where the boulevard curves and starts to go down hill. At that point, the subway tracks and platforms are on the south side of the boulevard, with the northern platform under the center of the street. That’s because subway tracks don’t make sharp turns, and the road curves more to the south and then the north at that point than the tracks do. Subway tracks also go up and down slowly, so at the top of the hill, the tracks are farther underground than they are at the bottom. So much so that the there is an entire level between the tracks and the road that sometimes disappears. In other words, the tree planting conditions change as the boulevard moves along. 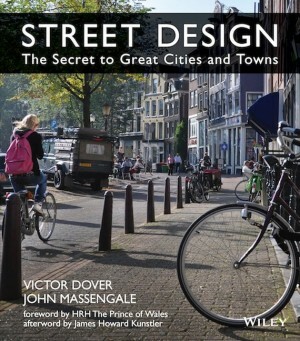 But design is a way of solving problems and these issues can be tackled when a real design is worked out. In addition, our section shows that we envisioned a raised median in the center, much like the ones on Park Avenue and Houston Street in Manhattan, where trees are planted over tracks. Perhaps the subway station just behind the aerial view would have fewer trees than other parts of the boulevard. Perhaps not. That would all be worked out during the development of the design. * The modern boulevard and the modern avenue were both invented in France. Avenues were first laid out the 16 century in French royal gardens, using rows of trees to form allées through the woods that pointed to objects like fountains and obelisks. They first came into the city in places like the Champs Elysées in Paris, which were once royal hunting grounds outside the city walls. On axis with the palace at the Louvre, the avenue was brought into Paris as the city grew. The boulevard type was invented when rows of trees were planted on the bulwarks that formed the old city walls around Paris. Originally they were places to promenade, but as Paris grew, the boulevards became important city thoroughfares. As early as the 17th century, French kings began introducing new, wide, tree-lined boulevards and avenues into the medieval city fabric of Paris. In the 19th century, Napoleon III and Baron Hausmann radically cut many of these through the capital. This entry was posted in Beauty, Bicycle, Current, New York, Street Design, Urbanism. Bookmark the permalink.